Visiting delegation of the UK People’s Postcode Lottery, Department of Environmental Affairs, Peace Parks Foundation, SANParks and CSIR staff members at the launch of the Postcode Meerkat Wide Area Surveillance System. It also has the future potential to be used in a conservation role, for example, to better understand animal behaviour. A wide-area surveillance system, known as the Postcode Meerkat, was launched in Kruger National Park on Wednesday, reports the Letaba Herald. South African National Parks (SANParks), Peace Parks Foundation and South Africa’s Council for Scientific and Industrial Research (CSIR) have partnered to research, develop and manufacture this innovative system. The Postcode Meerkat comprises a suite of radar and electro-optic sensors that will detect, classify, monitor and track humans moving in the park over a wide area. In addition, the system has been designed to be mobile so that it can be rapidly deployed to prevent poaching crisis zones from developing. This is the first time that this kind of technology is being applied in a counter-poaching role in a bushveld environment, which makes the system unique. Smart thinking in its development allows it to differentiate between humans and animals, while its application will guarantee early warning and rapid response capabilities. This will augment ranger reaction times, allow for better preparation and support the proactive apprehension of poachers, which could save the lives of both humans and animals. It also has the future potential to be used in a conservation role, for example to better understand animal behaviour. The Postcode Meerkat will significantly increase KNP’s ability to protect rhino and other vulnerable species. 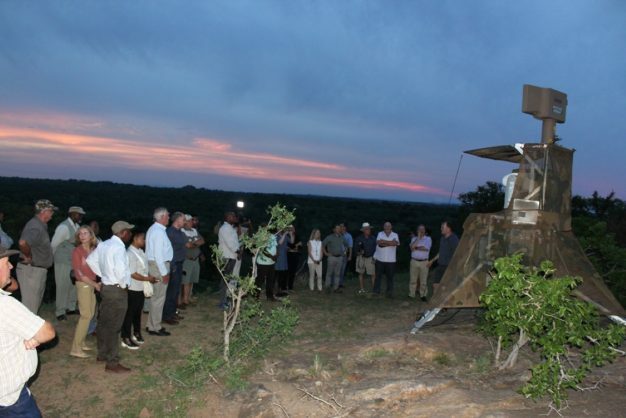 It will enhance the capacity to combat wildlife crime, along with the many other systems already put in place, such as improved ranger skills and support, increased aerial and ground mobility, gate access control and zones with increased wildlife protection. Apart from developing and manufacturing the system, the CSIR will also provide ongoing technical and administrative support to KNP. Funding for the development and deployment of the Postcode Meerkat was secured by Peace Parks Foundation from the People’s Postcode Lottery of the UK, made possible thanks to the lottery players. Funding the Postcode Meerkat is the People’s Postcode Lottery’s first-ever support of a project in KNP and to be commended. Hazel Johnston and Jo Bucci of the UK People’s Postcode Lottery Kathy Bergs, Werner Myburgh of Peace Parks Foundation and Francois Anderson of CSIR listen and look on at the surveillance system demonstration. The Council for Scientific and Industrial Research (CSIR) in South Africa is one of the leading scientific and technology research, development and implementation organisations in Africa. It undertakes directed and multidisciplinary research, technological innovation and industrial and scientific development to improve the quality of life of the country’s people. Peace Parks Foundation facilitates the establishment of transfrontier conservation areas and develops human resources, thereby supporting sustainable economic development, the conservation of biodiversity and regional peace and stability. Since 2013, the Foundation has been working closely with the South African department of environmental affairs and its conservation management authorities, SANParks and Ezemvelo KZN Wildlife, to initiate detailed projects as part of the multifaceted Rhino Protection Programme. More news your way, follow The Citizen on Facebook and Twitter.